If you are a regular reader of this not-at-all regular blog, you will know that I’ve written before about my fascination with ‘creative coincidences’, the way in which writers will sometimes alight upon the same idea at the same time for no apparent reason, or a rash of books with similar themes or settings will appear within a short space of time. Those original posts were prompted by my then-recent discovery that a book covering ground similar to my junior novel Surface Tension had just come out in the US. As is the way of these things, I’ve more recently discovered that another book with the same setting – of a town ‘drowned’ to make way for a reservoir – came out late last year in Canada. I became aware of this while idly Googling the phrase “The Town That Drowned”, which was high on my list of possible titles for the US publication of Surface Tension, scheduled for later this year. Yes, that sound you hear is the gnashing of teeth. Yes, the title of the Canadian book, which looks absolutely gorgeous and has been shortlisted for a slew of awards, is The Town That Drowned. On a blog I read while surfing around gnashing my teeth, someone even commented that the ‘drowned town’ idea is ‘becoming something of a theme in Canadian literature’. My friends, you cannot escape the zeitgeist. Once upon a time there was a story. It was a lovely story with absolutely NO BEARS in it-not a SINGLE BEAR anywhere. Yes, I know. This is more than a little eerie. 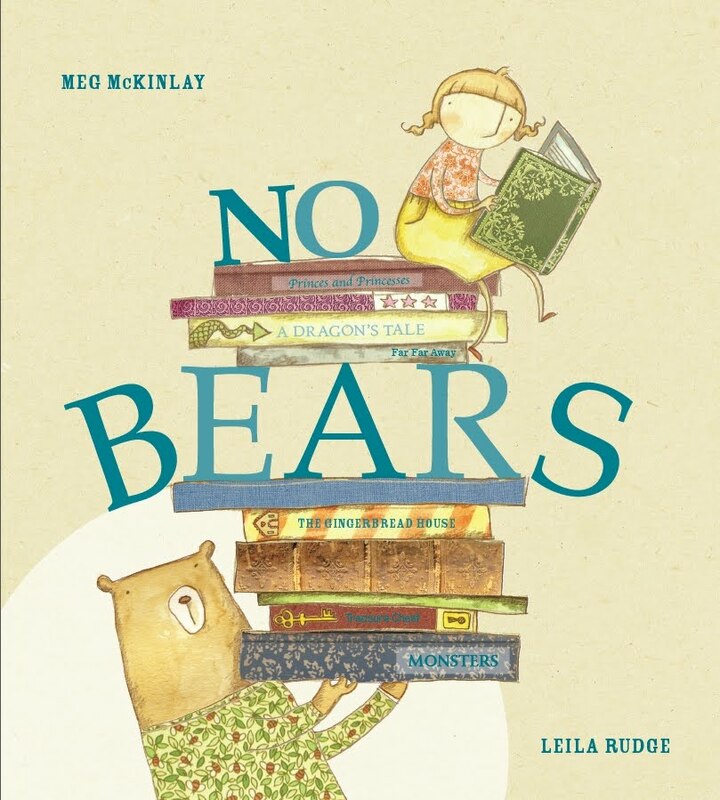 My picture book, No Bears, was published here in Australia in June 2011. More Bears! was published in the US in November 2010. There is absolutely no way at all I could have read Nesbitt’s book, written my own, had it contracted by a commercial publisher, illustrated, designed, typeset, published, in a six-month time span. So yes, this is another example of ‘creative coincidence’, and it’s particularly funny to me because the evolution of No Bears has been particularly replete with these. mid-2008: I’ve just sent the draft of a duck story off to my editor. Ducks keep cropping up in everything I write. One day, in frustration, I type the words THERE ARE NO DUCKS IN THIS STORY! just to keep them at bay. mid-2008, five seconds later: I go ooh. Because that seems like it might be the beginning of a story. A story about [no] ducks. I take a few notes and stow them away in a file. later-2008-early-2009: I tinker with the idea, work up a draft, pitch the idea to some SCBWI buddies. They seem to like it. I rework the draft. May 2009: I send a draft ms to my editor. It’s called No Ducks in this Story! May 2009, a few days later: At local library, thumbing through pbs. Come across Barbara Kanninen’s A Story With Pictures. Come across the line “There are no ducks in this story!” Commence shallow breathing. Continue reading book and discover it is, thankfully, very different. Jan-Feb 2010: For a while, the ms is known as “No Somethings in this Story”. In early Feb, I embrace the change to bears and redraft the story. It’s called No Bears In This Book. Later Feb 2010: Editor notes they are already publishing a book called There Are No Cats In This Book. We change title to No Bears. Feb 2010-June 2011: Illustrations, tweaking of text, design, copyedit, proofs, etc. November 2010: Somewhere on the other side of the world, Sourcebooks publishes Kenn Nesbitt’s More Bears! Thankfully, I remain blissfully unaware. June 2011: Somewhere on this side of the world, Walker Books publishes No Bears. Kenn Nesbitt, no doubt, remains blissfully unaware. June 2011-present: Various well-meaning readers suggest that perhaps No Bears In This Book! might have been a better, more alliterative title. I am somehow able to remain calm in my response. March 2012: Candlewick publishes No Bears in the US. In closing, I will simply add that I would love to see these books duelling each other somewhere, somehow. More Bears! No Bears! That, I suspect, would be one seriously fun storytime. This entry was posted in No Bears and tagged infernal plagiarists, zeitgeist on May 11, 2012 by Meg McKinlay. I like your dueling Bears books idea. What a great post. I love how you shared the evolution of the original idea. Coincidences like this are, I suppose, not so hard to believe when you think of all the people in the world. There's got to be an overlap of ideas more often than we'd like to think. Yes, Mirka. I've set works-in-progress aside, too, when things I felt were too similar came out. It can be a very difficult part of this work we do. I'm very glad I didn't hear about More Bears before No Bears came out. I have no doubt my publisher would have gone ahead, but it would have felt awkward to me. Ruth, thanks. I'm never sure if this stuff is boring, narcissistic, or interesting. I would find it interesting, so I guess I use that as my guide. I like what you said about 'all the people in the world'. When you put it like that, it seems a much simpler matter. Very well-done, Meg! This was a clear and informative post. Once, I'd just finished a draft of a PB and walked into the school library where I taught to discover the newly-published WEIRD PARENTS, which was so similar to what I'd just finished drafting! Shock! You're doing a great job of bearing with it all. :)I am buying your bear books for our granddaughters; one's favorite stuffed animal is her well-loved Bear! The world is well big enough for both no bears and more bears! But you raise a fascinating point (again). When I say the same thing to family or friends who don't write, I'm not sure they really get it. It's as if there are only so many ideas doled out by the angels at anyone given time across the world, but now that we have the Internet we are all noticing it! Another writing buddy described it as this humongous cultural consciousness that we are all tapping into, and sometimes, some of us come away with very similar things. (Actually that sounds awfully like that new data cloud that's formed over all our heads in recent time and keeps downloading things to our mobiles and ipads. I hope it doesn't block out the sun). When I first started by latest book (finally coming out as an ebook in a few months) a few years back, I came up with this marvellous title – I loved it: Avatar. Damn, had to get rid of that after writing only a few chapters.